Want to get Cognizant Off Campus Mega Drive Freshers? 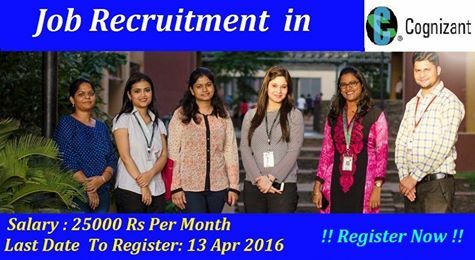 Very urgent recruitment for freshers and experienced candidates. Now check it below. Cognizant Technology Solutions is an American [multinational corporation] that provides custom information technology, consulting, and business process outsourcing services. It is headquartered in Teaneck, New Jersey, United States. Over two thirds of its employees are based in India. Cognizant is listed in the NASDAQ-100 and the S&P 500 indices. Originally founded as an in-house technology unit of Dun & Bradstreet in 1994, Cognizant started serving external clients in 1996.It made an IPO in 1998, after a series of corporate splits and restructures of its parent companies. � Deep knowledge of at least one area of specialization. � Theoretical knowledge of concepts and technology. � Responsible for delivery of assigned work, under supervision. Needs to understand quality processes within Cognizant. Skills: Should have Basic to Intermediate Analytical abilities. Possess Basic information in zone of Specialization.